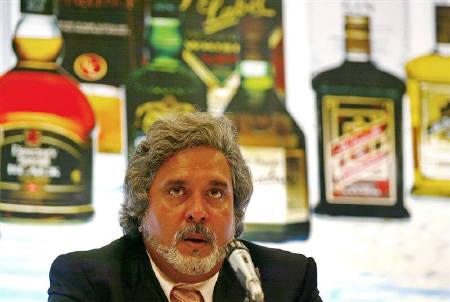 London-based Diageo's acquisition of United Spirits from Vijay Mallya will bring its confrontation with arch rival Pernod Ricard to the Indian shores. All over the world, the two snipe at each other's market all the time. Diageo, the world's largest spirits company, sold liquor worth $17.28 billion in 2011, which included brands such as Smirnoff vodka, Johnnie Walker whiskey, Baileys liqueur and Guinness stout. 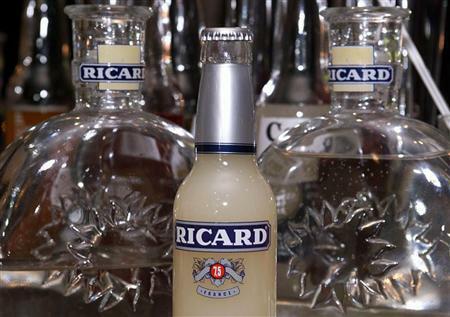 Paris-headquartered Pernod Ricard is second to Diageo in the global sweepstakes. Its 2011 revenue was at $11.09 billion, but it claims to be the leader in the premium segment. It owns brands like Absolut, Ballantine's, Beefeater, Chivas Regal, Jacob's Creek, Jameson, Kahlua, Royal Salute and Seagram's. 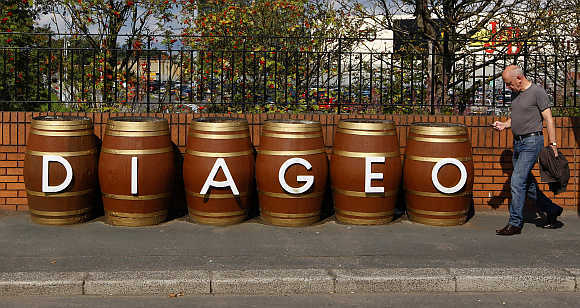 Image: A man walks past barrels outside the Diageo Shieldhall facility near Glasgow, Scotland. The slugfest will now happen in India. United Spirits sells 125 million cases (of 12 bottles each) in a year, more than half of the market of 240 million cases. Pernod Ricard's volumes are lower, about 24 million cases, though it is second in the pecking order, ahead of local rivals like Radico Khaitan, Jagatjit Industries and Kishore Chhabria's Allied Blenders & Distillers. So, Diageo will start with a huge lead over Pernod Ricard. 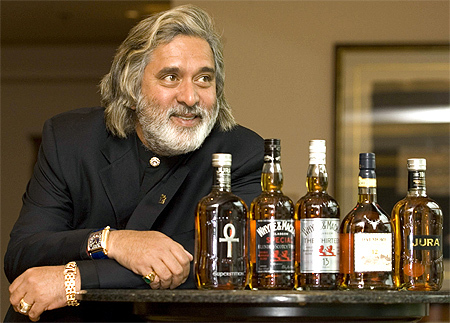 All told, United Spirits owns 22 'millionaire' brands -- each sells more than a million cases. Diageo's first innings in India ended abruptly in 2002, when it decided to focus on North America and Europe. But, observers had said the exit was prompted by the absence of popular brands in its portfolio -- a gap the acquisition of United Spirits plugs perfectly. Diageo's brands at that time included Gilbey's Green Label, ranked among the top four whisky brands at that time. Among the international brands in its repertoire were Johnnie Walker, J&B and Smirnoff. Though Pernod Ricard sells less than a quarter of United Spirits, it has inherent strength. It is far more profitable than United Spirits because it has gone for premium pricing -- 10 to 15 per cent above rivals. So, its volumes might be lower but the profit margins are fatter. United Spirits, on the other hand, has gained volumes by offering discounts. So, while United Spirits closed 2011-12 with a net profit of Rs 317 crore (Rs 3.17 billion) on sales of Rs 8,214 crore (Rs 82.14 billion), Pernod Ricard, in India, recorded a much higher profit of Rs 500 crore on lower sales of Rs 3,000 crore (Rs 30 billion). In case the fight with Diageo boils down to an all-out marketing war, Pernod Ricard can pack a lot of firepower. The chief executive of a liquor company who does not wish to be named says: "The trade normally gets a discount of 10-12 per cent on products sold by manufacturers. But United Spirits offers an additional 10-15 per cent to retailers, depending on the market and brand. While this ensures retailers will push United Spirits's products aggressively, margins for the company are thin." In the absence of advertising, spirits makers have to rely on surrogate advertisements and retailer discounts to push their brands. Image: Pernod Ricard, chief executive officer, Pierre Pringuet attends an interview with Reuters at the company's headquarters in Paris. However, the discounts offered by United Spirits may soon come down. With a bottom line-driven parent like Diageo, the company is likely to reduce its dependence on discounts. Multinational corporations, by and large, don't approve of such discounts -- they devalue the brand and rob the company of pricing power. Their intolerance to selling below price can be gauged from the recent example of Beam Global. The maker of the Teacher's whiskey recently initiated a probe into allegations of unfair trade practices, apparently triggered by discounts and freebies being offered to retailers in a few markets. Beam's India managing director, Harish Moolchandani, national sales head, Deepak Malhotra, and a few other executives were asked to stay away from work while the inquiry was going on. Where does that leave Pernod Ricard? A detailed questionnaire as well as repeated calls to Pernod Ricard did not yield any response. Opinion is divided on the French company's prospects. 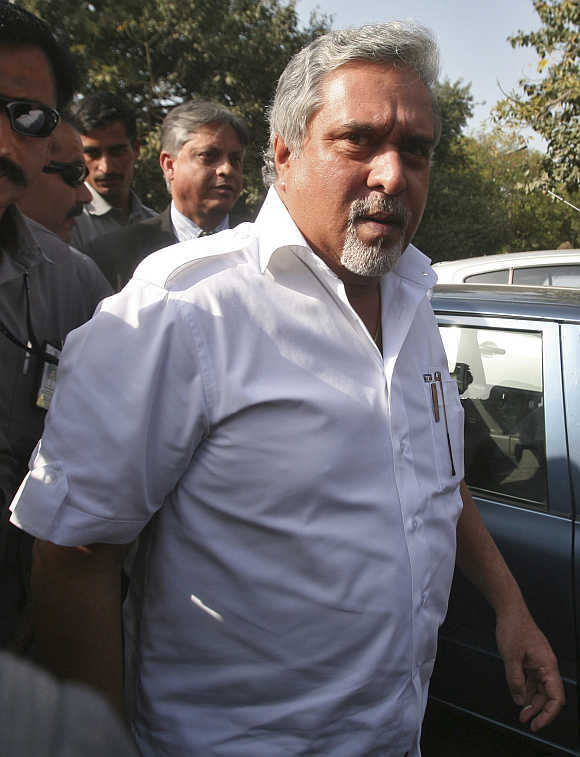 Some feel Diageo would be able to leverage United Spirits's huge volumes to shut out rivals. So, Pernod Ricard will have to begin focusing on volumes a bit more than it does now if it has to hold its ground against the United Spirits-Diageo combine. Image: Thi file photo shows a bottle of ''ready-to-drink'' pastis, the famous French anise-flavoured aperitif, seen at a bar in Toulouse. "The profitability angle worked well as long as Pernod Ricard was fighting United Spirits; but, with Diageo in the picture, the dynamics change," says a Mumbai-based analyst who tracks the sector. The other argument is equally compelling. With rising income levels, Indian consumers are up-trading. As a result, the premium segment of the market is growing faster than the mass, or popular, segment. So, in the really long run, what will decide the winner in the market is the premium segment. In other words, while United Spirits's volumes will give Diageo a huge start, it will have to develop premium brands sooner than later. 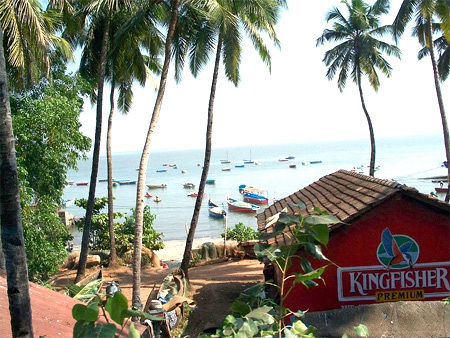 Image: An ad for Kingfisher beer. Pernod Ricard had got a foothold in the masstige category (mass + prestige), with the acquisition of Seagram's more than 10 years ago; it added brands like Royal Stag (with 12.3 million cases, the 'made for India' whiskey has become Pernod Ricard's largest-selling brand anywhere in the world), Blender's Pride and Imperial Blue to its portfolio. Diageo and Pernod Ricard had jointly bid for Seagram's global wine and spirits portfolio. Diageo had the option of buying its India business, which it declined, and, it was later acquired by Pernod Ricard. Since then it has added more brands in this category, such as Imperial Blue. Image: A child sleeps at a shop selling whisky in Hanoi. Deepak Roy, executive vice-chairman & chief executive officer, Allied Blenders & Distillers, which competes with both United Spirits and Pernod Ricard, says: "While Pernod Ricard has believed in premiumising its portfolio, its appeal actually cuts across (segments). "People find it aspirational to consume their brands. "That should hold them in good stead." In recent years, Pernod Ricard has attempted to expand its portfolio with extensions such as Blender's Pride Reserve and Royal Stag Select Barrel. "That was the big chink in United Spirits's armour," says a liquor distributor based in Maharashtra. "While United Spirits has been premiumising its portfolio in recent years, attempting to target consumers both at the upper and lower ends of the market, it hardly shook Pernod Ricard. 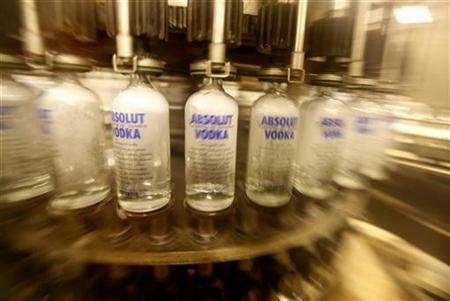 Image: Empty bottles are washed on a production line at the Absolut bottling facility in Ahus. 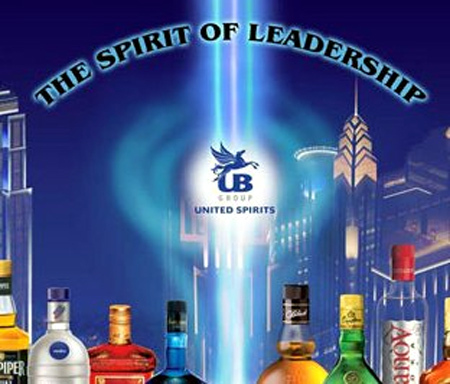 But, a premium name such as Diageo would help United Spirits enormously. 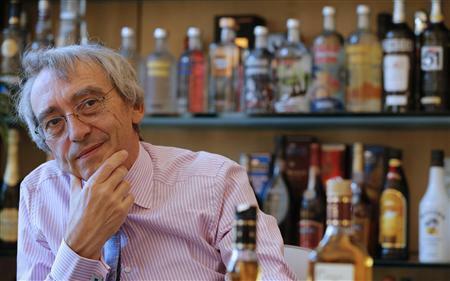 It will, in a sense, bring it on a par with Pernod Ricard, which has positioned itself as a producer of classy brands." In other words, Diageo, in all likelihood, will go after Pernod Ricard in the premium segment with all it has. Pernod Ricard offers a wide range of brands in India. From Imperial Blue to Royal Stag, Blender's Pride, 100 Pipers, Chivas Regal and Ballantine's, its brands straddle the whisky pyramid from regular to premium Scotch. It has a few more products, such as Absolut and Fuel, catering to both the upper and the lower ends of the vodka market. But experts say the company will have to consider expanding the breadth of its portfolio if it has to take on Diageo-United Spirits, which has over 140 products. For instance, Pernod Ricard has a strong whisky and vodka portfolio, but nothing much in rum or brandy. Its Seagram's gin, according to trade, has been wound down, much like its Nine Hills wine portfolio. But many believe Pernod Ricard is no lame duck in the market and it still has the necessary firepower to take on the Diageo-United Spirits combine. The company has been growing at an annual clip of 25 per cent in India. The market just got more interesting. 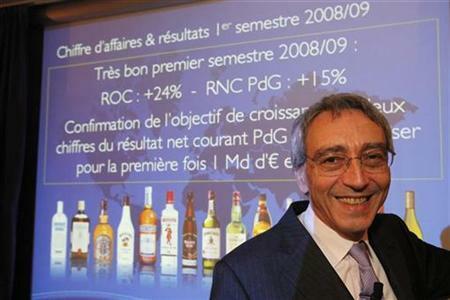 Image: Pierre Pringuet, managing director of Pernod Ricard, poses before the company's 2008 annual results presentation near Paris.